As many of you are aware of, John Hill passed away unexpectedly from heart failure on January 12, 2015. Feel free to read his obituary posted in the Santa Fe New Mexican, the local newspaper in the city my father retired and lived in his remainder years. As sad as this tragic event is, he left behind an awesome legacy for many of his wargaming fans and friends, not to mention his beloved family. He was a successful wargamer, railroader, military analyst and family man. I am John Hill’s daughter and only child and I have created this website as a tribute to him and his talents. This site serves to allow everyone who knew and admired him and his works such as Across A Deadly Field (ADF) and Johnny Reb (JR) to leave stories, comments and anything else you wish to say. There were so many people whose lives were affected or improved by the drive and ambition my father demonstrated throughout his 69 years. Many of his long-time friends, associates, colleagues and fellow wargamers were deeply saddened by this sudden loss. There is a Facebook tribute page and also a Wikipedia page about my father, but I wanted to also create this website/blog, where his fellow gamers can post wargame strategy ideas, constructive criticism and any other remarks as well as links to write-ups, ADF game rules. interviews, articles, reviews, Q&A and other information resources available about ADF and my father, John Hill. One of the most recent and detailed write-ups about his accomplishments appears in the magazine Armchair General. 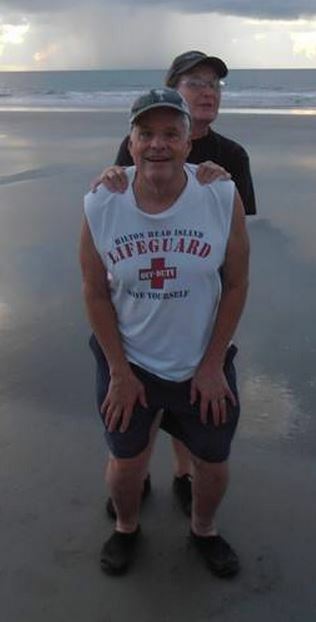 In October of 2015 my mother and I visited one of my father’s favorite places to vacation – Hilton Head, South Carolina. My parents frequented this beautiful beach resort town many years prior to his passing. To the right is a picture taken of the two of them at Hilton Head. When my mom and I were there in the fall of 2015, we scattered a portion of my father’s ashes in the Atlantic Ocean. The banner on the top of this page was created using photographs taken from our trip. Even following his passing, his legacy continues with a new Across A Deadly Field (ADF) book through Osprey Publishing, to be released May 2015. Thank you to each of you for being a wonderful part of this well renounced wargame designer. For more information about ADF, go to the ADF Resources page where you can shop for ADF products as well as download quick reference charts. My father’s wargames are available for purchase from Amazon, Barnes & Noble and E-Bay . In addition, if you click to Amazon through this website and make ANY purchase you are helping to carry on this wonderful man’s legacy, because even if you do not purchase the specific wargames being promoted on this site, you are still helping to maintain this tribute site and all the information and resources on it. More explained about this on my post regarding Shopping via Amazon. You can also visit my affiliate disclaimer. Stephanie, what a noble task to write a website in honor of your father. I feel the love and care for him and his living on in the memory of the world. It speaks a lot to your upbringing and your family bonds. your dedication to him feels so genuine and beautiful! May your efforts contribute to bring love to all fathers and mothers from their children! Thank you so much for visiting my father’s tribute site. My family was and still is very close. I was taught growing up that family always comes first. Thank you for the very kind words. Have a wonderful day! I feel privileged to have worked next to your Dad for several years when he was in government service. I considered him a friend and mentor, and I regret losing touch with him after he moved out west. I was pretty “green,” and he was a patient and talented teacher. It was doubly cool because I had grown up playing Squad Leader in high school and college. I know that after his first heart attack in the mid-90’s, your father really took seriously his diet and exercise regimen, and he did it because he wanted very much to be able to spend more time on this Earth with his family. I’m glad that he was able to! This website is a great tribute to his memory. God bless you and your family. It is always a huge pleasure to connect with those who personally knew my father and worked closely with him as you obviously did. You are so correct about my father taking his health and exercise regiment seriously after his first heart attack. He did not even know he had a problem until he had a heart attack. My father always took pretty good care of himself to begin with. He never smoked, he would stay active and yet, he still had a heart attack. He was always known his for patience and his ability to instruct and teach. He loved showing people new things and especially enjoyed working with those who were as passionate about learning as he was. Thanks for sharing your experience and memories of my father Tom. It put a big smile on my face this evening. I am sorry to hear of your dads passing. In those days I was into wargaming and we played Squad Leader in Crown Point, IN. He had a passion for wargaming that was unmatched. I see that he designed many games over the years and won awards for them. The video with him and Dean West is great. Thank you for stopping and leaving a comment. It is always good to hear from those who knew my father personally and played some of his games to include Squad Leader. The Scale Model Shop in Lafayette is where my father met some of his earliest wargaming comrades and where my earliest childhood memories resonant. My father certainly did have a passion for wargaming that was unmatched. He had indeed designed many wargames as you can see from this list and achieved many awards for them. Hey Stephanie, I really think your dad would be proud of you for this. He sounds like a good guy. I wish you the best success with this site keeping his memory alive. Thank you Jason for the incredibly nice words. I think he would be proud too. Dear Stephanie! You are great daughter of great parents. Only such person can create something that will leave and remind father alive always. I don’t know anything about your father but I am impressed. God bless you and your family! Thank you so much for taking the time to visit today and thank you for your very kind comment. I appreciate that. I hope everything is going well for you. God Bless you and your family too. Sorry for your loss, but your dad was such an amazing person and father that will always be in your heart and thoughts! I take great pleasure in reading about such an amazing man and about all that he has accomplished throughout his beautiful life! Thank you for writing this! Thank you for the very sweet and tender words. I am glad you enjoyed visiting my father’s tribute site. I hope you visit again soon. Have a wonderful day! Secondly, I want to express the respect I have for your father. So many accomplishments throughout his life! I am happy to hear that his work was acknowledged. You definitely have a parent to be proud of! It is amazing that you honour your father with this website. You’re a great daughter, Steph! Thank you for your very kind words. I have chosen to honor my father the best way I knew now and that is through creating a website in which I pour my heart and soul into. This website has you can probably tell has become my baby. I have worked extremely hard to make it as friendly, informative and pleasant as I can. I appreciate you taking the time to visit today and leave a wonderful comment. I hope to see you again soon. I remember you and it is great to hear from you again. I completely remember you coming to the house we had in Falls Church, Virginia on several occasions and playing wargames. I hope Katherine and Kathlyne are doing well. My mother remembers you and your daughter stopping in at their home here in Santa Fe on your way to Las Vegas. I also remember you and my father talking on the phone for hours. My father would talk forever on subjects that he was passionate about and of course, that includes discussions on Squad Leader and Johnny Reb. Thank you so much for stopping and checking out this tribute site of your dear friend John. Have a wonderful day! Please keep in touch! I’m so sorry for you lost. Although I don’t know this super-awesome Men but I would like to say it’s men like John Hill gives us hope of humanity to carry on. Even though he’s in a better place than us he humble spirit lives on through others he have touched. Thank you Devorah for the very kind words. Today is actually the one year anniversary of his passing, so it is hard on us. What a beautiful tribute to your father. Regrettably, I never knew the man but though your writings feel like I missed someone special. Thanks for sharing this. Thank you so much for visiting my father’s tribute site and for leaving a very kind comment. As you can see from the commentaries left from those who knew him, such as Duke Siefried and others, my father was very well liked. As I approach my retirement years already I have had friends pass away, without a trace, other than a sentence on a headstone. It’s really nice that you are using your blogging skills to memorialize you dad, and his passion. This is a very nice website, well laid out, a very professional presentation. Thank you for the kind words. My father accomplished so much in his lifetime, it seemed like a shame to not memorialize him in a respectable and honorable way. And yes, I too have seen people whom I have known for a long time pass away and leave nothing more than a sentence or two on their tombstone and a short paragraph in the local town’s newspaper. I loved my father and I wanted to do more for him than just that. The feedback from family and lifelong close friends as well as warmhearted colleagues and new friends such as yourself has been overwhelming and I certainly appreciate the kind sympathies and sentiments. Thank you for visiting and reading the About page. Please feel free to check out some of the other things that have been mentioned in my posts about my father, such as his awards he won, his humorous videos of him accepting his awards, my Happy Anniversary message to my parents, my posting about Zozobra and more. Stephanie this is certainly a reverent tribute to your dad, something I’m sure he would be proud of if he were around today. An accomplished boardgame designer, he must have had a historian’s passion for this. I wonder if any of today’s modern generals play these games. I would think the tactical elements would still be applicable for conventional battle. Anyway, its good you are keeping his spirit and games such as ADF and Squad Leader alive. Thank you for reading the About page and learning more about the purpose and focus behind the design of this website. Yes. it is a tribute site to my late father who built a magnificent career with designing wargames. He was a military history major in college and followed his passion all through his life, developing games about historical battles that were fought. He wanted to teach history through play and role modeling. Many students became interested in history when they were young as a result. I am not sure if any of today’s modern general play games like Johnny Reb, Squad Leader or ADF, but I think they could learn ways to strategically win battles through playing the various scenarios in my father’s board games. The ADF Game Rules are based on real possible scenarios that were indeed a reality during those battles and wars. Stephanie…I am humbled and moved by this tribute to your Dad, John Hill. Perhaps I will do something for my Dad who passed away in January this year. what an excellent website. So well done…so professional. Thank you for visiting. I am so sorry for the loss of your father. My father also passed away in January of this year. We lost both of our Dads. I think you should build a website as a tribute to your father. You can post photos, memories, things that were unique to your father, hobbies he had, whether or not he served in the military, etc. There is so much more to my father other than wargaming, that I am thinking of writing a post about some of his other interests and aspects. This is very sad news indeed. While we never met John face-to-face, we did have the honor of interviewing him back in 2010. We feel very fortunate to have this enduring glimpse into his life and work. His achievements and qualities, listed by so many of his fans, friends and family across the internet, need not to be repeated here. We’ll just say he will be long remembered and sorely missed. Thank you Jeff and Dave for your comment. I appreciate you taking the time to pay your respects and talk a little about your interview with my father five years ago. You are right in that he will be long remembered and sorely missed by his fans, friends and family. Please come back and visit again soon. It’s great to know you’re the daughter of John Hill, and I’ve heard of his awesome work before 🙂 I used to play a lot of Warhammer at school lunchtimes when I was younger, and I actually came across some of your father’s games once when I conducted a Google search. I’m sorry to hear that he passed away, and his legacy will live on for a very long time with war gaming fans. Thank you for your incredibly heartfelt comment. I am thrilled that you know of my father’s work and even played Warhammer at school lunchtimes when you were a child. That is when so many people become hooked on wargames is when they are young. I know my father always spoke about having an active imagination when he was little and often getting into trouble in school for daydreaming too much. It came from being creative and not being to sit for very long. All the way to the end, my father maintained his creativity and high energy levels, which enabled him to not only have an active full-time career as a military analyst for the government, but have a thriving business on the side designing wargames, such as the ones you surely came across on Google to include Squad Leader, Johnny Reb and his most recent Across A Deadly Field Game Rules. Thank you for leaving a comment. Please come back and visit soon. It is sad to know about your father. I know how it feels as my father died when I was 16. Your father is a great game designer. I really like the kind of games he designed. It is a great thing I came across your website. It is very helpful. I am very excited to show this to my friends. Thank you for your condolences. I am sorry about the loss of your father too. Losing your father at such a young age such of only 16 had to be hard on you and your family. At that age, we are slowly moving into adulthood and need our parents more than ever. Sorry for your loss. Thank you for the compliments on my father being a great game designer. I am glad you like the type of games he designed. Certainly feel free to pass it along to your friends and come back soon. Thank you for taking the time to stop and leave a few remarks. It means so much. Very well done. I truly enjoyed looking through this site. It is obvious that this is something close to your heart. Thank you so much for taking the time to go through my site. I appreciate your kindness. And yes, it is something that is close to my heart. God Bless you! What a great thing to do in memory of your Dad – he will be very honored. Your dedication will echo his own and the Legacy shall continue. I am hoping to see the legacy continue and his creative contribution be remembered by so many. Thank you for heartfelt sentiments. So sorry for your loss. You have indeed developed a great tribute to your father, I am sure he would be proud of you. I am a gamer and love war games, I don’t think I have played his though. Will have to change that. Thank you for your sentiments. I think he would be proud too. If you do ever have a chance to play ADF, you will have to let me know how you like it and if you like it as much as the other wargames you have played. I think it is wonderful that you are honoring your father with this website! And I think he would be blessed to see what a wonderful job you are doing with this website in his honor! Blessings to you as you continue this adventure! I live in the Atlanta area (East between Stone Mt. and Athens) I have ADF and have not been able to get a game in yet. I own two Union Corps (the 1st and 11th based on Johnny Reb II and Gettysburg and Longstreet’s Corp based the same and same battle). Im looking to play ADF , as a tribute to a great man. I am a long time Squad Leader(ASL) player so John Hill is the finest designer ever and I’m sorry I didn’t get to NASHCON last year ro meet him. Anyone living in the ATL wanting to play ADF please look me up. Thank you Jim for the comment. I appreciate that. My father always enjoyed hearing from those you were players of not just ADF but Johnny Reb and Squad Leader too. He would have enjoyed meeting you. I met your Dad st Hidtoricon.He was always generous with his time and a fun game master. We enjoyed talking about my ancestor, William Pittenger who won Gongessinial Metal of Honor in 1863. I once died so gloriously in one of his games, he declared ma an honorary Confederate! I got a chuckle when I read your post, because I can totally see my father declaring someone an “Honorary Confederate”. He always had that type of upbeat sense of humor! Thank you for sharing. You probably don’t remember me you were such a young thing when I used to playtest games for your father. I had many a great experience doing this. I was really sad when he left Lafayette he was a good friend and I’m sorry I didn’t keep in contact with him much after you moved. I remember him having a fit about Avalon Hill’s demand that he use a PazerBlizt/Leader type game board for Squad Leader (didn’t like having to have roads continuing across the boards). I asked him why a road ended and got a blank look. He said “They end because they got to where they were going. Like an Orchard, Factory or collapsed bridge or some such.’ Boy, did he ever brighten up and he started to design all sorts of boards for Squad Leader. He even named several of the officers after me but they got dropped after Avalon Hill did their playtest. I was finally able to finish my collection of his designs this last week when I picked up his ‘Conflict of Heroes – Storm of Steel – Kursk. I now have one (some 2) of everything he designed. I still have one of the 2 playtest copies of Yalu. Say hi to your mother for me, I really liked eating her chocolate chip cookies at 3 in the morning after a long playtest session. Lisa enjoyed her company and still remembers the time the 4 of us when to Lake Geneva for one of the early GenCons. I will be putting on the second Annual John Hill Remembrance Day later this month in Lafayette. For all us olde foggies who remember him and also playtested his games. I know we already connected with each other via email, because I wanted to personally thank you for the incredibly kind and thoughtful comment you left, but I also wished to reply to your comment on my father’s tribute site. You are correct in that I do not remember you, but rest assure my mother remembers you very fondly. She did have the absolute best chocolate chip cookies in the world. Norris Darral, another wargaming friend that of course you know well, also recently commented on her chocolate chip cookies via Facebook. Whenever my neighbor friends came over, they would always delve into her cookies often spoiling their appetite for supper. My mother also remembers the boat ride on the Ore Boat where you and my father played games and my mother and Lisa put jigsaw puzzles together. She remembers how much fun the four of you had. I look forward to hearing more about the Second Annual John Hill Remembrance Day. I saw the postings on the JRIII Yahoo Groups and it appears there will be a huge turnout for the event. I hope you will be able to send me some photos from that special day. Thank you again for taking the time to show how much you miss John (my father) and how much he meant to you. Please stay in touch!